Abstract: Do refugee inflows have an effect on state fragility? In this article I examine whether refugee inflows, commonly associated in the literature with economic and cultural pressures, result in a more fragile state by means of increased violent group grievance. Violent group grievance captures a distinct form of intrastate violence, specifically small-scale hate crimes and ethnic group clashes associated with powerlessness and discrimination. The main hypothesis in this paper is that refugee inflows may increase violent group grievance. I examine the effect of refugee inflows on the level of domestic violent group grievance using quantitative analyses based on original large-N datasets and cross-sectional longitudinal models to fill gaps in the literature on state fragility. This study controls for alternative explanations and covers the time period between 2006 and 2014. The analysis results confirm the main hypothesis of this paper. Do refugee inflows have an effect on state fragility? In this article I examine whether the number of refugees, commonly associated in the literature with cultural and economic pressures in the host country, result in a more fragile state by means of increased violent group grievance. Refugees are defined in this study as “individuals forced to flee their country due to persecution, war, or violence with well-founded fear of persecution for reasons of race, religion, nationality, political opinion, or membership of a particular social group” . According to the Fragile States Index (FSI), violent group grievance is the “violence existing between social groups” . Violent group grievance captures a distinct form of intrastate violence, specifically hate crimes and ethnic group clashes associated with powerlessness and discrimination. In particular, this measure of violence captures “ethnic clashes” such as hate crimes or intrastate conflicts attributable to discrimination. My main hypothesis in this paper is that as the number of refugees increases violent group grievance due to economic and cultural conflict between refugees and citizens also increases. I expect the primary participants in this conflict to be the minority refugee group and citizens (i.e. natives) of the host country. Other actors such as government officials (e.g. governing elites, their armed forces, and police) or “external” participants (e.g. Peace Officers, foreign militaries) may also intervene in the conflict to prevent persecution or influence the outcome. In this paper I focus on the conflict by which citizens violently resist refugees due to shared perceptions that they may have the most to lose (e.g. job security, cultural integrity, political influence) to refugees. The foundation of the argument is that refugees increase ethnic diversity which in turn may lead to violent group grievance. In contrast, refugee absence equates to less ethnic diversity and thus less violent group grievances, as defined in this article. By committing violence against the refugees, citizens may believe they protect their economic security (e.g. employment opportunities) and assumed dominant national culture including traditional and religious practices. In short, citizens may view refugees as an economic and/or cultural threat. Thus, they may engage in violence over preexisting economic resources and cultural traditions. The dependent variable provided by the Fragile States Index involves only measures of violence such as hate crimes or intrastate conflicts attributable to ethnic clashes. Further, this study assumes that there is a ‘dominant’ national culture and tradition in the host state; it does not account for cases where the incoming refugees are of the same culture as the host state’s culture or that of a major group in the state . In this paper, the concept of “culture” is defined as linguistic, religious, ethnic, and racial elements which individuals often subconsciously use to create their sociocultural identities. For example, cultural (or even subcultural) differences could be as overt as religious practices and appearance (e.g. wearing yarmulke, burka, etc.) or as subtle as an accent variation of the same language (e.g. British vs. American English). I begin with a literature review on the connection between violent group grievance and the number of refugees. I then construct a theoretical framework based on economic interest theory and social identity theory to examine the mechanism of the relationship between the number of refugees and associated pressures (i.e. cultural differences and competition for resources) and violent group grievance (i.e. hate crimes and intrastate violence attributable to ethnic clashes). I proceed to describe the research design, data, and methodology to test for these effects. Finally, I describe the findings of my analysis and conclude. Intrastate violence can manifest in a multitude of ways ranging from small-scale hate crimes and homicides to mass-casualty civil war. This literature review focuses solely on one specific form of unlawful violence: violent group grievance. Unlike the voluminous literature on civil war, violent group grievance remains largely understudied, which is surprising given the increase of intrastate violence since the Second World War (, p. 3). I first discuss existing literature on the relationship between violent group grievance and refugees and then proceed to discuss the theoretical framework of this study that addresses some of the shortcomings in the violent group grievance literature. In the literature the connection between violent group grievance and refugees is understudied. The existing literature on refugees and violent group grievance is based mainly on qualitative studies. A review of existing literature reveals two main findings: the presence of refugees 1) incites violence [5, 6, 7] and 2) has a mixed or neutral effect on violence [8, 9, 10]. Rule  argues that ethnic violence associated with refugee presence may be attributable to differences amongst social groups. These differences can be political representation, access to resources, or tolerance of contrasting cultural practices such as religion or language. Rule hypothesizes these differences can build to a point of social frustration within a society that may lead to “violent action, not often directed against governments after all, but against members of antagonistic ethnic, racial, or religious groups” (p. 204). Rule does not address the mechanism of the connection between social differences and frustration, but does hypothesize a positive effect of frustration on violence. He argues the “primary source of the human capacity for violence appears to be the frustration-aggression mechanism…If frustrations are sufficiently prolonged or sharply felt, aggression is quite likely [whereby] men who are frustrated have an innate disposition to do violence in proportion to the intensity of their frustration” (, p. 202). The essence of the theory suggests intergroup frustration amongst refugees and natives has potential to turn violent when individuals perceive “indignation or perceived injustice” (, p. 202). To be sure, “frustration” is neither a necessary nor sufficient condition for social conflict. There are other mediating factors not addressed in Rule’s analytical framework. To illustrate, there are cases where individuals of a population suffer, even starve to death, but still do not engage in violent conflict. An example would be the Islamic Republic of Iran, which is considered amongst the most ethnically diverse and politically corrupt countries annually with over 12 million civilians experiencing starvation (largely attributable to sanctions imposed by the United States) [11, 12]. Members of ten primary ethnic groups in Iran (e.g. Persians, Azerbaijanis, Kurds, Lurs, etc.) experience food poverty and immense repression from their government yet do not engage in violent conflict against their government, one another, or refugees. Thus, other factors may be present under which conflict may or may not manifest from civil frustration. Group grievances are also channeled via non-violent group resistance, such as exclusion of minorities from positions of authority, which in fact is more prevalent than violent group resistance . However, non-violent group resistance is beyond the scope of this analysis. Gurr  discusses this frustration-aggression mechanism with reference to relative deprivation. Relative deprivation theory states there are perceived capacities (or value expectations) which have potential to create social comparison and in some cases violence (, p. 22). Specifically, this “destructive behavior [violence] incites as circumstances and quality of life change and groups experience a lack of satisfaction and subsequent frustration” (, p. 22). In this case, for example, natives may blame refugees as if they perceive diminishing economic wellbeing if resources or job opportunities are limited. Thus, natives may compare their economic resources or perceived economic wellbeing before and after the arrival of refugees, become frustrated, and in some cases violently resist. According to Zolberg et al. rapid, basic transformation of a society’s state and class structures may lead to violence attributable to inequality and oppression of “subordinate classes” including refugees and peasants (, p. 245). Zolberg et al. argue minorities are frequently the victims of small-scale violent conflict because they lack the resource capacity to flee elsewhere (, p. 256–257). This factor of availability of group resources at the time of societal changes may condition the relationship in ways Rule  does not take into account. Zolberg et al. did not systematically test the relationship between radical social transformation and violence, but they do make a probabilistic argument that rapid social transformation (i.e. effects of globalization) may lead to ethnic violence where neither society nor the state is capable of effectively managing distribution of economic resources, territories, etc. between natives and refugees (, p. 256–257). The latter findings suggest that refugees may have a mixed or neutral effect on violent group grievance as argued by Richmond and Valtonen . Richmond and Valtonen argue that “state sovereignty can no longer be maintained in an absolute way… where boundaries are permeable for money, goods, and information but not for people” (, p. 205). He suggests that economic and developmental factors condition the effect of the number of refugees on conflict, which he examines via a qualitative analysis on “catalysts of social, economic, and political change rooted in migration pressures” (, p. 26). According to Richmond and Valtonen, the presence of refugees often has a mixed effect on violence depending on whether political institutions provide economic opportunity and integration for refugees in the labor market (, p. 26). Opportunity in this context refers to refugee capacity to joining the workforce as a driving factor of a growing economy. In contrast, when host countries (such as South Africa in the 1950s) do not provide aid in terms of social services (e.g. job placement or welfare for the unemployed) conflict may be more likely (, p. 25). Thus, for Richmond and Valtonen an important factor that may affect the level of violent group conflict is the state policies aimed at incorporating refugees in the economy and labor market; in other words the driving factor in conflict avoidance is the host country’s capacity of providing economic opportunity. To my knowledge, there are no systematic studies that examine directly the relationship between institutional arrangements for economic integration and violence. Koopmans  takes into account political factors that may explain violent group grievance. He examines European cases from 1988 to 1993 to assess the apparent effect of the number of refugees on internal violence and voting for radical parties of the right. Koopmans explores whether or not the presence of refugees has an effect on violent ethnic conflict and right wing voting intended to prevent further influxes of minorities. He presents a theoretical argument on grievance and opportunity to explain the assumed connection between radical party voting and violence attributable to racism. To clarify, he theorizes natives attribute their hardships to refugees and thus violently express grievances against refugee groups when elected political elites “enable” (actual or perceived) social justifications for doing so. The findings show Germany experienced the highest level of internal violence involving refugees and minority groups due to a “combination of nationalist rhetoric by established parties and swift and effective policies restricting the rights of foreigners and refugees” (, p. 211). A weakness of Koopmans’ study is the lack of specification and operationalization of the violence measure. The author simply refers to this measure as capturing “extreme right and racist violent actions” (, p. 204). In this quantitative study, different countries have conflicting definitions and interpretations of what racist violence may be. For example, the “racial violence” measure for Great Britain could include “threatening behavior or physical attacks” reported by refugees/native British, whereas the violence measure for Germany required Volksverhetzung (incitement to racial hatred) influencing an act of violence reported to and involving police authority (, p. 189). Consistent anti-Semitic hate crimes and small-scale acts of violence are an example of cases frequently included in Koopmans’ analysis. Further, Koopmans concludes that results are mixed due to other intervening factors such as police presence and aspects of political party and level of democracy. This study presents an argument for political parties conditioning the effect of the number of refugees on violent group grievance that is consistent with the expectation described above that in democracies the level of violence may be higher than that in autocratic regimes. The underlying theory is that democracies permit grievances to be aired in the form of public demonstrations that have potential to turn violent, whereas autocracies often repress such demonstrations from occurring. More recently, Krcmaric  examines social structural factors by considering why refugee flows may cause conflict in some host states but not others. He argues “refugees cause conflict when they alter the host state’s ethnic balance of power [in their favor]” (, p. 182). This ethnic balance of power refers to the host state’s “ethnic contract… a bargain that specifies how groups divide benefits in accordance with the underlying distribution of power” (, p. 183). He concludes shifts in relative power may result in shifts of this ethnic contract for social, political, or resource benefits and thus subsequently incite violence over these changes. In short, refugees obtaining political or social power (by means of elections or otherwise) may experience an increase in benefits that citizens may perceive as unjust and use violence to maintain their perceived claim to existing benefits. Krcmaric  applies theories of bargaining failure and war to the number of refugees and ethnic violence. Essentially the capacity to negotiate and compromise on territories, laws, and cultural practices conditions the effect of the relationship between refugee flows and violence. He examines the case of Serbia’s Kosovo region in 1999 when “animosity” between ethnic Albanians and native Serbians escalated rapidly as oppressive policies of Serbian president Slobodan Milosevic fueled growth of resistance groups (, p. 195). After Milosevic launched an ethnic-cleansing operation against Albanian villages in Serbia hundreds of thousands of citizens fled south towards Albania and Macedonia. Both of these countries had remarkable social, geographic, economic, and political similarities with the notable exception of ethnic composition and sociopolitical tolerance (, pp. 206, 214). Demographically, Macedonia consisted of a Slav majority with an Albanian minority and Albania was a homogeneously Albanian population. As the crisis intensified and over 300,000 Kosovar Albanian refugees crossed into Macedonia, “ethnic animosity increased and police and border guards allegedly abused refugees” inciting refugee retaliation and persistent small-scale conflicts thereafter (, p. 206). Refugees responded by first organizing a group known as the National Liberation Army (NLA) and then setting demands for the use of Albanian as “the official state language, a new census, an Albanian university, and greater influence in national politics” due to the radical demographic shift (, p. 208). Krcmaric argues the sudden influx of Kosovar Albanians in Macedonia “upset the distribution of latent power and distribution of benefits between the Slav majority and Albanian minority” (, pp. 196, 207) which incited violent group grievance across the region . Meanwhile, Albania, incurring over 400,000 Kosovar Albanian refugees, provided refugees with resources (even homes) to facilitate the mass migration (, p. 212). In doing so, refugees were reportedly “grateful” and began looking for work in the region to establish cross national relationships and solutions for economic and social prosperity. His findings suggest Macedonia experienced conflict because civilians perceived refugee flows to “upset the level of power between the country’s ethnic groups” (, p. 214). Krcmaric argues this stark contrast in violent or non-violent outcome is attributable to the ethnic balance of power; In essence, there was no native group to act on a perceived threat, whereas the Slav majority in Macedonia feared becoming the demographic minority and violently repressed to maintain economic and political power and the benefits of such power (e.g. territory or job opportunity). In sum, existing literature on the connection between refugees and violent group grievance examines a number of socio-structural, psychological, and political factors that may help explain cases where the number of refugees result in varying degrees of violence. However, there is a lack of data and systematic analyses to evaluate different propositions. In this article I examine this question systematically; I construct a more developed theoretical framework incorporating both economic and cultural-based theories to articulate why I expect the number of refugees to result in increased violent group grievance. Then I conduct an analysis that controls for intervening factors. In this section, I argue that the connection between the number of refugees and violent group grievance can partly be explained by differences in culture (e.g. language or religion) and/or competition for resources. Violence can indeed occur between members of the same ethnic group. However, this does not align with my theoretical framework to suggest violence results from language or religious tensions amongst members of the same ethnic group (e.g. Syrians in Germany) since the out-group (i.e. refugees) collectively share an identity which may violently clash with the in-group (i.e. native citizens) due to cultural differences and/or competition for resources. Thus, controlling for the same/different ethnicity would provide a more vigorous test of my claim. This would perhaps even allow the possibility to distinguish between racial and ethnic effects also. Due to data limitations, however, my argument that violent group grievance can partly be explained by differences in culture remains an assumption since data does not reveal if refugee groups of a given country, year are of a certain ethnicity. I propose the mechanism of social identity and economic interest theory affects violent group grievance occurring within a state. Differences between social ethnic groups may become increasingly significant when one group attempts to violently suppress the other in an effort to protect resources, way of life, or out of xenophobic tension . Thus, the number of refugees may increase the level of violent group grievance occurring within a state as differences amongst the in and out-groups become recognized and stimulate prejudices capable of turning violent. Citizens perceiving economic and cultural threats associated with refugees are more likely to manifest violent group grievance to avoid the damaging effects of this perceived threat than those who do not, unless the political regime is capable and willing of effective repression (for instance Egypt and China). Sniderman et al. examine the basis of this civil opposition to immigrant minorities. Their analysis relies on public opinion survey data collected in The Netherlands from 1997–1998. Findings suggest that considerations for national identity “dominate those of economic advantage which evoke exclusionary policies” and anti-immigrant sentiments at large (, p. 35). I examine how economic and cultural factors may result in violence- not just anti-immigrant sentiments. Scholars such as Rule  incorporate aspects of religion or language into their definition of culture. My definition of culture includes consideration for racial (i.e. xenophobic) tension as well. By incorporating the possibility for cultural (i.e. racial or ethnic) factors to play a role in addition to economic and political conditions, we might be able to better understand why states exhibit violence without resource scarcity. Lake and Rothchild  argued, “ethnic violence is most often caused by collective fears of the future” (, p. 41). They provide a theoretical link between “collective fears” and ethnic conflict. They argue most ethnic groups coexist quite harmoniously until “ethnicity is linked with acute social uncertainty, a history of conflict, and fear of what the future might bring” (, p. 43). As these fears arise “states lose their ability to arbitrate between groups or provide credible guarantees of protection for groups which as central authority declines, become fearful for their survival” (, p. 43). This conflict could then begin to manifest as the masses begin to fear for the safety and struggle to resolve perceived dilemmas surrounding culture or resources. It is a distinctly separate condition from a purely economic-driven assumption to explain why conflict may occur. In sum, the number of refugees may result in violent group grievance due to social, political, and economic conditions. I argue that cultural in addition to economic theories may help us understand the relationship between the number of refugees and violent group grievance. Specifically, I rely on the social identity and economic interest theory to examine the relationship between refugee presence and violent group grievance. I argue that when aspects of group identities such as ethnicity, language, or religion are impacted by an increase in immigration, the primary ethnic group may resist the perceived threat(s) posed by refugees. This resistance may take the form of violent means to 1) prevent their national identity and way of life from being compromised and 2) protect access to scarce economic resources. The social identity theory postulates that perceived threat from conflicting religious values, and opportunity for misunderstandings based on language or cultural differences can incite protest participation, panic, even violence (, pp. 35–36). The premise of this theory is that individuals of a society exist, interact, and compete across a variety of social groups for relative power, resources, and benefits [18, 19]. In this case, natives of a host country function as the in-group, while refugees may be treated as the out-group and as a result are targeted for a perceived threat to in-group way of life and resources. The social identity theory is an emotion-based approach to understanding violent group grievance. Petersen  argues that emotion (primarily fear, hatred, and resentment) is a “mechanism that triggers action to satisfying a pressing concern” , p. 17). He argues an emotion like fear or hatred “raises the saliency of one concern over another and heightens cognitive and physical capabilities necessary to respond to the situational challenge” , p. 17–18). Thus, a native in-group perceiving a threat to aspects of their culture may act on their negative emotions to preserve their cultural identity and way of life. According to Petersen  violent group grievance may occur when 1) a structural change (such as a refugee influx) occurs, 2) the native in-group perceives a threat, and 3) collectively builds emotions such as fear, hatred, or resentment-based, then 4) act on emotions to resist perceived threats to wellbeing (i.e. cultural integrity or access to resources) (, p. 23). To be clear, he does not propose a mechanism that turns resentment among the native population into violence. I, however, argue this mechanism is the perceived threat to culture and/or resources. O’Rourke and Sinnott  argue non-economic, cultural factors may even be the main drivers of anti-immigrant and refugee sentiments. They suggest natives derive utility from “living in a society with a well-defined sense of national identity and well-understood and accepted social norms… natives may oppose excessive immigration on the grounds that it undermines these norms with or without disliking foreigners per se” , p. 844). To test these assumptions O’Rourke and Sinnott  use the 1995 International Social Survey Programme (ISSP) module on national identity. Citizens from 24 countries were polled from 1995-1996 to determine the level of anti-immigrant and refugee sentiments. Findings suggest respondents demonstrated “attitudes towards immigration reflecting nationalist sentiment”, especially when natives perceive refugees to have limited skills and subsequent contribution to their economy (, p. 857). Further, the economic interest theory posits actual or perceived competition for scarce resources translates into inter-group conflict [22, 23]. Rule , Zolberg et al. , and Krcmaric  refer to this potential for competition for economic resources to incite conflict between social groups but do not take into account social factors. Specifically, the social identity argument may help to explain some of the case anomalies where competition for resources falls short as an explanation for violent conflict [24, 25, 26]. My underlying theoretical assumption then is that citizens of the host country resort to violence in an attempt to protect 1) existing economic/resource benefits and 2) their cultural practices and way of life . However, developmental, political, and institutional factors are expected to mitigate the effects of these inflows on conflict. For example, economically developed states have policies such as labor laws and safety nets that serve as an economic buffer to “external” influences (such as the number of refugees) which developing countries often lack (, pp. 29–31, , p. 84). Further, democratic regimes may experience more conflict because of constitutional protections for freedom of association such as protests, demonstrations, and institutions that may mobilize supporters based on such identities of culture (e.g. ethnicity or religion). Then again, democracies are based on greater tolerance of diversity that may result in less violence. My model controls for level of democracy that allows for testing of these alternative effects. With recent conflicts such as that of Syria resulting in increased refugees, assumptions can be made for aspects of social competition and potential for cultural clashes to influence states (particularly developing states) in profound ways. This research is designed to examine the level of association between the number of refugees and violent group grievance. Implications are then derived to tentatively assess the potential value or consequences refugee influxes pose for the host country. In this study the dependent variable is violent group grievance. The Fragile States Index (FSI) states that group grievance is the “tension and violence existing between social groups and the state’s ability to provide security is undermined allowing the potential for further fear and violence” . The Fund for Peace provides this variable by using quantitative and qualitative analyses to derive a 1 (low levels of violent grievance) -10 (severe violent grievance) value for 178 states annually starting in 2015. Low levels of violent group grievance suggest rare and relatively less-severe occurrences of ethnic violence (e.g. single hate crime resulting in a single death), where as high level of violent grievance suggest frequent and severe (i.e. high morbidity and mortality) acts of ethnic violence (e.g. mass shootings, persecution, violent repression). Variable measures comprised within the FSI violent group grievance variable include discrimination, powerlessness, and intrastate violence. More specifically, this measure of violence captures “ethnic clashes” such as hate crimes or intrastate conflicts attributable to discrimination . For example, these violent events must involve ethnic clashes rather than interpersonal (e.g. relationships) or criminal (e.g. robbery). “Ethnic” in this context is used to distinguish between the dominant national culture and that of incoming refugees . The main independent variable does not distinguish among ethnic groups. As such, cases that do not have a dominant culture are included in my analysis; this may be considered a limitation to this study. The data do not distinguish among native and refugee ethnic groups. The assumption is that the dominant native culture and the refugee culture vary. Further, “group” refers to ethnic groups rather than number of people. To be clear, a case of a single attacker who stabs a refugee would be included. In short, this measure includes all intrastate conflict associated with ethnic violence, such as ethnic civil wars or demonstrations against refugees becoming violent, for example. The main independent variable refugees is defined as “individuals forced to flee their country due to persecution, war, or violence with well-founded fear of persecution for reasons of race, religion, nationality, political opinion, or membership of a particular social group” . The World Bank provides number of refugees by estimating the refugee population by country/territory of asylum for 264 states annually from 1960-2014. I use number of refugees in the model (not the percent of refugees as a percent of the population) due to the widespread “visibility” of their presence irrespective of the size of the host state’s population, especially via the mass media, local and national. Based on the previously discussed theoretical mechanism, I expect pressures associated with the number of refugees to increase violent conflict. The underlying mechanism is citizens may perceive refugees as a threat to resources or culture, rather than contributing members to a growing workforce, and engage in violence to preserve their way of life and access to scarce resources. Civil frustration and ethnic tension may result in hate crimes (i.e. group grievance) against refugees and small-scale social conflict capable of contributing to a state’s fragility by means of unlawful violence. A state quickly ending violence could be observed as less fragile, but the assumption is that strong states with governing authority are able to mitigate, prevent, or deter the majority of these cases. GDP per capita is the gross domestic product divided by midyear population in U.S. currency. World Bank, the source of these data, operationalize GDP per capita by using the “sum of gross value added by all resident producers in the economy plus any taxes and minus any subsidies not included in the value of the products. Calculations do not include deductions for depreciation of fabricated assets, depletion, or degradation of natural resources” . The expected relationship between GDP/Capita and violent group grievance is negative, suggesting that an increase in GDP/capita will result in fewer grievances. The assumption is that socioeconomic wellbeing for citizens results in more resources and thus less competition for such resources and so decreasing the potential for violent grievances. The United Nations Development Programme provides this variable. Rather than just an economic indicator of development, this variable measures levels in 1) life expectancy, 2) education, and 3) income . It is a composite statistic ranging from zero to one. Higher ratings indicate higher levels of human development. I expect higher levels of violent group grievance in developing compared to developed states. In less developed countries (LDCs) where citizens may face higher unemployment levels and struggle to secure a living, they may be more vulnerable economically and thus more likely to compete for already limited resources for survival. In LDCs refugees consuming scarce resources may be more likely to trigger violence by citizens against perceived contributors to economic hardship. In developed states where resources are relatively less scarce and thus competition for resources lower, lower levels of violent group grievance are expected. Further, I assume that increases in human development address certain grievances (such as economic hardship), whereas lower levels of human development may be associated with competition for scarce resources leading to violence. I utilize two indicators to capture democracy. First, the Polity IV Project provides data on the level of democracy for 167 countries from 1946-2015. The values range from Autocracy (-10) to Full Democracy (10). Second, the World Bank created a “Voice and Accountability” variable to capture perceptions of the “extent to which citizens are able to participate in selecting their government, as well as freedom of expression, association, and a free media” . This variable has a range from -2.5 to 2.5 for a given country, year. Lower values signify weaker democracy, while higher values signify stronger democracy in relation to the variable description above. The two indicators are correlated at 0.8395, but there is no multicollinearity to affect tests of statistical significance. Democracies often permit citizens (through constitutions or political doctrine) to participate in public protests and demonstrations, which have the potential to turn violent as grievances are aired. Protest demonstrations and alternative institutional arrangements (e.g. political parties and organizations) may be largely suppressed in autocracies, thus less violent group grievance would be expected. However, democratic institutions are channels for the expression for citizen grievances so it may be argued that less violence is likely in democracies than in autocratic regimes. Thus, democracy may be associated positively of negatively with violent group conflict. I expect higher levels of violent group grievance in democratic compared to autocratic states. In democracies constitutional protections exist for citizens to have the right to participate in public protests and demonstrations, which have the potential to turn violent as grievances are aired. Protest demonstrations and alternative institutional arrangements (e.g. political parties and organizations) may be largely suppressed in autocracies, thus less violent group grievance would be expected. On the other hand, however, democratic institutions are channels for the expression for citizen grievances so it may be argued that less violence is likely in democracies than in autocratic regimes. For example, citizens in a democracy may use the vote to act on their underlying grievances whereas citizens in autocracies or authoritarian political systems are not able to participate in elections and therefore may take it upon themselves to act on their grievances against perceived threats. Therefore, although I expect higher levels of violent group grievance in democracies than autocracies, the effect may be in the opposite direction. This variable, a Worldwide Governance Indicator, is operationalized as the perceptions of the extent to which public power is exercised for private gain. Control of Corruption also has a range from -2.5 to 2.5 for a given country, year. Similarly, lower values signify weaker control of corruption, while higher values signify stronger control of corruption in relation to the variable description. I expect the relationship between control of corruption and group grievance to be negative, suggesting that a government’s inability to control corruption results in an increase in violent group grievance. This may be due to the allocation of resources to address pressures resulting from the number of refugees. States that have greater control of corruption may allocate such resources more effectively (addressing refugees’ needs and citizens’ grievances) thus containing the level of violence compared to states that have less control of corruption. The World Bank operationalizes Political Stability as the perceptions of the likelihood of politically motivated violence, including acts of terrorism. This measure of politically motivated violence includes acts of state-sponsored and non-state group acts of terrorism. Non-state group acts of terrorism are included only if the attack was committed to advance a political cause. By this definition, I expect the relationship between political stability and violent group grievance to be negative, suggesting that a government capable of inflicting or permitting politically-motivated violence on its citizens to also be capable of repressing citizens from committing acts of violent group grievance. This Worldwide Governance Indicator also has a range from -2.5 to 2.5 for a given country, year. Lower values signify weaker stability, while higher values signify stronger stability in relation to the variable description above. The World Bank contains a variable indicator of population size for country-year, defined operationally as the number of residents of the state regardless of legal status/citizenship . I anticipate a positive relationship between population size and grievance, suggesting that in states with larger populations the opportunity for violence may be larger than in countries with smaller populations. On the other hand, larger states are better equipped to deal with refugees and might also be more diverse, thus lessening the cultural threat perception. The unit of analysis for this research design is Country, Year. The sample is 178 countries from 2006-2014. This timeframe is attributable to data restriction since The Fragile States Index started in 2005 and thus in the most recent decade data in regard to refugees has become more robust and available to the public. Furthermore, I use a one-year lag for both development (HDI) and control of corruption since grievances associated with either would likely take time to manifest. I estimate the effects using a Driscoll-Kraay XT Regression that corrects for heteroskedasticity. I use a cross-sectional longitudinal (XT) model with fixed effects to assess the relationship between refugee pressures and violent group grievance. H1 I expect a positive relationship between the number of refugees and violent group grievance. H2 I expect a negative relationship between GDP/Capita and violent group grievance. H3 I expect higher levels of violent group grievance in developing compared to developed states. H4 I expect higher levels of violent group grievance in democratic compared to autocratic states. H5 I expect a negative relationship between control of corruption and violent group grievance. H6 I expect a negative relationship between political stability and violent group grievance. H7 I expect a positive relationship between population size and violent group grievance. Table 1 shows the effect of the number of refugees on violent group grievance is statistically significant and in the anticipated direction. The regression results indicate that as refugee pressures increase, group grievance also increases by 5.00e-07 on average . To illustrate, an increase in refugees from 100,000 to 200,000 results in an increase of .05 in the index of violent group grievance (a scale from 1 to 10). This finding confirms the main hypothesis of this study on the effect of refugee pressures on violent group grievance. The effect on the dependent variable is shown in Figure 1, which shows the statistically significant, positive relationship between number of refugees and violent group grievance. Predicted values of violent group grievance as numbers of refugees increase from zero to three million are shown on the Y-axis of Figure 1. As this figure indicates, high numbers of refugees are not always “necessary” for a state to experience mid-to-high degrees of violent grievance capable of impacting fragility . 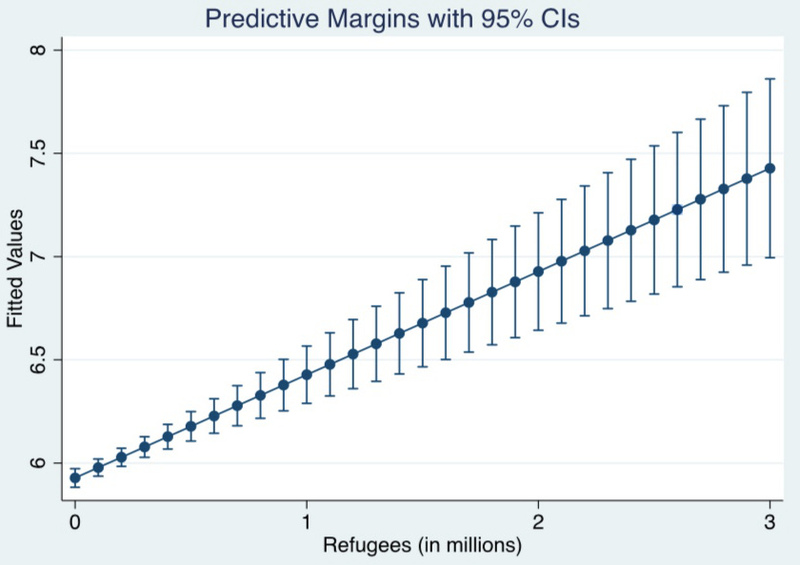 This finding suggests that number of refugees is an important determinant of state fragility. As such, the inclusion of refugees belongs in the security studies literature. All control variables are statistically significant. However, four coefficients are not in the direction expected. First, the relationship between GDP/capita and violent group grievance is positive; suggesting increased GDP/capita results in more violent group grievance. This finding appears to be reinforcing the argument made by Sniderman et al. that cultural factors may account for violent conflict even in circumstances where there is relative economic prosperity. However, the unanticipated negative effect needs to be investigated further. To be sure, GDP/per capita is not an indicator of wealth distribution, or level of economic inequality that may be a better predictor of violent group grievance. Second, the relationship between HDI and violent group grievance is also positive. While contrary to initial expectation, the finding mirrors that of GDP/capita therefore not surprising. This finding suggests that an increase in development in terms of education, longevity, and income also results in increased violent group grievance. This may be attributable to civilians violently resisting perceived threats from the number of refugees to protect current benefits associated with development. Third, the relationship between voice and accountability and violent group grievance is positive, suggesting that an increase of freedom of expression, association, and free media is associated with an increase in violent grievance. This may suggest the freedom to express grievances has potential to turn violent (e.g. protests resulting into riots). Lastly, the relationship between level of democracy and violent group grievance is positive, suggesting that increased democracy results in more violent group grievance. The rationale may reside in autocratic elites being able to effectively oppress citizen opposition and violence before violent group grievances increase. In contrast, democratic states permitting expression of grievances (e.g. protests) may indirectly permit increased opportunity for violence to erupt. Because of the unexpected directions of these coefficients, I test for multicollinearity to determine potentially highly collinear measures amongst the Worldwide Governance Indicators. Voice and accountability, control of corruption, and political stability were highly correlated, but further testing revealed that controlling for this collinearity did not affect the statistical significance or direction of any variables. Table 1: . Refugees and violent group grievance Driscoll-Kraay (DV) XT regression with fixed effects. Figure 1: . Refugees and violent group grievance. This research examines the relationship between the number of refugees and violent group grievance. The main hypothesis in this study was confirmed while controlling for a variety of factors associated with violent group grievance as an indicator of state fragility’s dimension of authority. This first large-N quantitative analysis is consistent with findings in the literature that number of refugees result in increased violent group grievance. I argue the theoretical mechanism for this relationship to be social competition for resources and preservation of cultural identity. In conclusion, states experiencing economic or cultural pressures associated with refugees may experience increased violent group grievance and thus increased fragility. My findings imply that richer, democratic states are more fragile in this context than less developed, autocratic states. This contradicts assumptions in the literature on fragile states suggesting rich democracies are often less fragile than poor developing countries . Improving data and exploring other potential determinants of violent group grievance may help researchers to better understand the mechanism and dynamics of this association. Now, a limitation of this study is that violent group grievance does not distinguish empirically between violence against refugees and that against immigrants. Rather, the measure captures ethnic violence, specifically hate crimes and conflicts attributable to discrimination. Such violence, to be sure, may include acts of violence committed against immigrants; however, it is not possible to deconstruct this index since each value of this variable is based on quantitative and qualitative data I do not have access to. To account in part for this limitation I attempted to locate data on the number of immigrants to include it in the analysis as a control variable. However, such data were not available for the cases and years included in my study. Another limitation of this study is that I assume that each country in the data sample has a “dominant” culture that is different from that of the refugees. Refugees that have the same culture as that of the dominant group or a group in the host state may experience less violent group grievance; but I do not test for this effect. Lastly, I incorporate a variety of economic (e.g. GDP/capita), social (e.g. human development, democracy), political (e.g. corruption, stability) and demographic (e.g. population size) variables to examine the relationship between the number of refugees and violent group grievance. However, I am unable to test certain cultural factors (e.g. language differences) across all countries due to data and empirical limitations. For example, I do not examine every refugee group’s relationship with all other countries (e.g. Syrian refugees in every host country outside of Syria with consideration for language differences), which deviates heavily from an exploratory study on violent group grievance to less-related aspects outside this study’s analytical scope. This large-N quantitative analysis is meant to provide an overall interpretation of the number of refugees and violent group grievance with available data. I gratefully acknowledge support and guidance provided by the University of Central Florida’s Political Science Department. I thank Barbara Kinsey, Kerstin Hamann, Demet Mousseau, Amy Kircher, and the anonymous reviewers for helpful comments and suggestions on previous drafts of this article. Further, I thank Sabina Lautensach and José A. F. Monteiro of Librello Publishing House for their financial assistance throughout the publication process. Their understanding and generosity provided opportunity for my work to be considered for publication. Personally, I also wish to acknowledge Diane Elmgren and William Laney who selflessly offered their time, insight, and support from the creation to publication of this article. Nations U. Defining a Refugee. Retrieved from The United Nations Refugee; 2017. Agency website: http://www.unrefugees.org/what-is- a-refugee/. Fund for Peace. Fragile States Index; 2014. Available at: http://ffp.statesindex.org. The primary independent variable is unable to be deconstructed to exclude specific cases where there is not a dominant national culture. As such, cases that do not have a dominant culture are included in my analysis; this may be considered a limitation to this study. Buhaug H. Relative Capability and Rebel Objective in Civil War. Journal of Peace Research. 2006;43(6):691–708. doi:10.1177/0022343306069255. Rule JB. Theories of Civil Violence. The American Political Science Review. 1989;83(4):1367. doi:10.2307/1961681. Lee SJ. Unraveling the ”Model Minority” Stereotype: Listening to Asian American Youth. The Journal of Asian Studies. 2015;57(3):809. doi:10.2307/2658752. Aristide R Zolberg SA Astri Suhrke. Escape from Violence: Conflict and the Refugee Crisis in the Developing World. American Journal of Sociology. 1992;96(3):770–772. doi:10.1086/229592. Krcmaric D. Refugee Flows, Ethnic Power Relations, and the Spread of Conflict. Security Studies. 2014;23(1):182–216. doi:10.1080/09636412.2014.874201. Lum ZA. ‘Pay It Forward’: Canada Resettles 29,000 Refugees; 2016. C Available from: http://www.huffingtonpost.ca/2016/12/24/syrian- refugees-in-canada n 13822554.html. Richmond AH VK. Global apartheid: refugees, racism, and the new world order. Choice Reviews Online. 1995;33(01):33–0563–33–0563. doi:10.5860/choice.33-0563. Koopmans R. Explaining the rise of racist and extreme right violence in Western Europe: Grievances or opportunities? European Jour- nal of Political Research. 1996;30(2):185–216. doi:10.1111/j.1475- 6765.1996.tb00674.x. Iran: 12 million people suffer from hunger - Minister. Na- tional Council of Resistance of Iran (NCRI). 7 Dec 2014; Avail- able from: http://www.ncr-iran.org/en/news/economy/17643-iran-12- million-people-suffer-from-hunger-minister. Gurr TR. Why men rebel. Routledge; 2015. Krcmaric uses the Stenkovec Protest as an example, whereby over two thousand Kosovar Albanian refugees protested against the harsh repression and treatment of Macedonians. The international Crisis Group stated this Albanian uprising in Macedonia lead to the state “teetering on the brink of collapse” (Krcmaric 2014, 207). I consider group members engaging in violent behavior as represen- tatives of their ethnic group. Paul M Sniderman MP Louk Hagendoorn. Predisposing Factors and Situational Triggers: Exclusionary Reactions to Immigrant Mi- norities. American Political Science Review. 2004;98(01):35–49. doi:10.1017/s000305540400098x. Lake DA, Rothchild D. Containing Fear: The Origins and Man- agement of Ethnic Conflict. International Security. 1996;21(2):41. doi:10.2307/2539070. Greenfield EA, Marks NF. Religious Social Identity as an Ex- planatory Factor for Associations Between More Frequent For- mal Religious Participation and Psychological Well-Being. Inter- national Journal for the Psychology of Religion. 2007;17(3):245–259. doi:10.1080/10508610701402309. Turner JC. Social comparison and social identity: Some prospects for intergroup behaviour. European Journal of Social Psychology. 1975;5(1):1–34. doi:10.1002/ejsp.2420050102. Pedersen T. Cooperative hegemony: power, ideas and institutions in regional integration. Review of International Studies. 2002;28(04). doi:10.1017/s0260210502006770. O’Rourke KH, Sinnott R. The determinants of individual atti- tudes towards immigration. European Journal of Political Economy. 2006;22(4):838–861. doi:10.1016/j.ejpoleco.2005.10.005. Michael Warnecke GK Roger D Masters. The roots of nationalism: Nonverbal behavior and xenophobia. Ethology and Sociobiology. 1992;13(4):267–282. doi:10.1016/0162-3095(92)90026-z. Brown R. Prejudice: Its social psychology. John Wiley & Sons; 2011. Capozza D, Brown R. Social identity processes: Trends in theory and research. Sage; 2000. Huddy L. From Social to Political Identity: A Critical Examination of Social Identity Theory. Political Psychology. 2001;22(1):127–156. doi:10.1111/0162-895x.00230. I acknowledge that on average only a small fraction of citizens re- sorts to violence. Thus, these events may be considered “rare” but nevertheless do occur in all states at varying levels. Schneider G, Barbieri K, Gleditsch NP. Does globalization contribute to peace? A critical survey of the literature. Globalization and armed conflict. 2003;pp. 3–29. Rodrik D. Globalization, social conflict and economic growth; 1997. In Conferencia de Ra´ ul Prebisch. Ginebra. Versi´ on revisada (en ingl´ es) disponible en http://www.ksg.harvard.edu/rodrik/global.pdf (Vol. 24). Fund for Peace. Index Methodology; 2017. Available from: http: //fsi.fundforpeace.org/methodology. World Bank; 2017. Available from: http://data.worldbank.org. The correlation between GDP/capita and the Human Development Index is 0.6884. See y-axis scale starting at 6 (rather than 0) on a 0–10 scale. Hendrix C BH. Food Insecurity and Conflict Dynamics: Causal Link- ages and Complex Feedbacks. Stability: International Journal of Security & Development. 2013;2(2):26. doi:10.5334/sta.bm.